When Disney’s Mickey Mouse met Minnie Mouse, it was a match made in heaven! Now the ultimate Disney romance and the beloved artistry of Thomas Kinkade come together to commemorate your true love with The Magic That Keeps Us Together Personalized Figurine, available in a limited edition of 95 casting days from The Hamilton Collection. This heartwarming Disney collectible features Mickey Mouse and Minnie Mouse posed upon a bench in a gazebo adorned with imagery inspired by the glorious garden art of Thomas Kinkade – and it can be personalized for FREE with both your names.What a tender tribute to your lasting relationship! 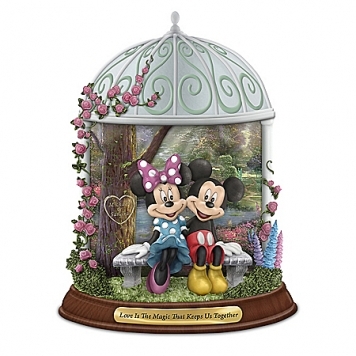 Finely handcrafted in artist’s resin, this charming figurine is beautifully detailed and hand-painted in colors inspired by Thomas Kinkade’s own palette, from the bas-relief scrolls of the gazebo to the fully sculptured flowers and the stately tree trunk that looks just like it’s been carved with both your names. It’s almost as if Mickey Mouse and Minnie Mouse are inside one of Thomas Kinkade’s paintings! Your personalized figurine rests upon a sculptured wood-look base with a golden metal title plaque. Strong demand is expected, so don’t wait. Order now!A fine collectible, not intended for children.